The arts bring us joy in every aspect of our lives. Crane River Theater wishes to be an outlet for that artistic expression. Our mission is to serve the communities of Central Nebraska as a professional theater production company providing a home for the presentation, education and promotion of the arts. 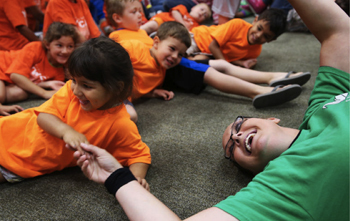 Crane River Theater produces a mainstream musical, children’s production and contemporary play each summer at various venues throughout the area. We are excited to bring professional artists from across the country, thus allowing Central Nebraska to become a destination for theater, music and dance. Kids of all ages can relate to the universal appeal of theater. It is for this reason that Crane River Theater created a series of library outreach programs for youth called Page to Stage. 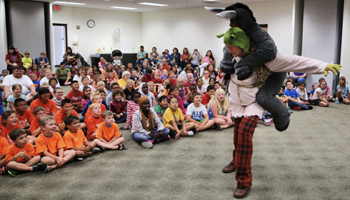 Cast members from our summer productions travel to area libraries as part of their summer reading programs with the hopes to inspire imaginations and instill a love for the arts. 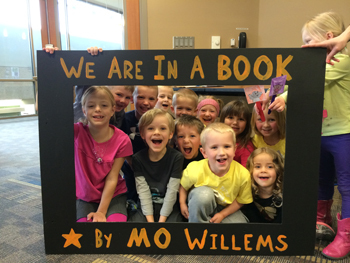 Allowing children the opportunity to see characters jump from the page of their favorite storybook and the words come to life before their very own eyes is truly invaluable. Crane River Theater is thrilled to have already presented Page to Stage to twelve area libraries, and is excited to reach out to even more communities throughout Central Nebraska in the years to come. Please contact our Education Director, Peg Sinnard, at 308-627-5796 for more information on these workshops or if your Library is interested in being a part of the next Page to Stage program.